I’ve been facilitating team planning sessions for over 20 years now and it’s some of my favourite client work to engage in. When I speak to new clients considering facilitators for an upcoming event or off-site, they often tell me they have no idea how to even begin the process of vetting the facilitators they’ve found. 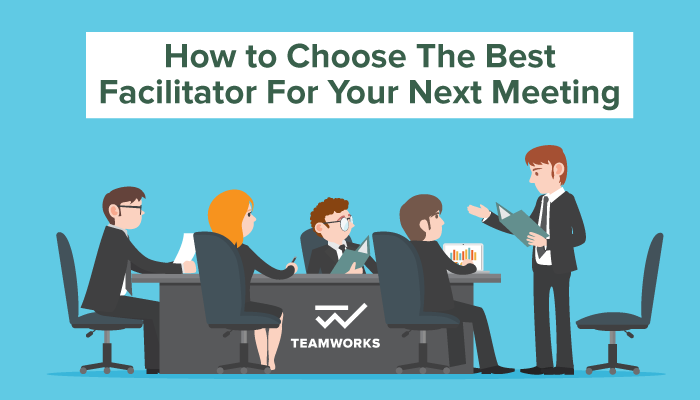 So we’ve put together this helpful little guide that outlines the core characteristics you should look for in a meeting facilitator. First, let’s begin by defining what a Facilitator really is. In this case, ‘facilitator’ is defined as: an expert who helps a group of people understand their common objectives and assists them in creating a plan to achieve these objectives; in doing so, the facilitator remains “neutral” meaning he/she does not take a particular position in the discussion. Understanding what a facilitator does and how they can be most effective, is the first step to finding the right facilitator for your needs. Next, let’s look at the specific abilities and characteristics that a great facilitator possesses and why that’s relevant to you. Your facilitator must be positive and forward-thinking. He/she also must be able to make everyone else think positively. If a facilitator has degrees of negativity and/or gives into the negative thinking that may exist in the organization already (what potentially prompted the need for an off-site or facilitator in the first place), it’s very hard to move forward and be successful with the facilitation. It’s usually best when a facilitator has three levels of experience: (1) broad business and organizational, (2) education both practical and academic and (3) previous facilitation experience. Some facilitators have 1 and 2, but not 3. This can present some problems. Facilitation is a complicated dance and if you’ve never done it before, it can be a challenge – even for those with amazing business and educational backgrounds. Offsite meetings can run for days (in fact, they should run for days) and each day can see long stretches of meetings. When you get into Hour 8 of Day 2, energy levels begin to drop which can lead to signing off on poor decisions just to advance to the next topic. A facilitator needs to keep their energy level up, but also make sure he/she boosts the energy level of others in the room. This can be done via breaks, games, or other techniques — but a great facilitator knows how and when to shake things up. The worst offsites are often when a facilitator totally clicks with ‘the sales guys’ but ‘the IT guys’ are tuning him out. You can’t have a silo’ed facilitator. He/she needs to resonate, or find some common experience, with all your business units at the event. Otherwise the non-connected units will tune out the facilitator, and it will come to be seen as a ‘marketing event’ or something along those lines. I pride myself on this aspect within my own business. I’ve done facilitations for alpha male and female CEO groups, trucker drivers, high school student groups, unions, government and non-profit organizations, . All very different groups and it’s imperative to find commonality with each group and person. Oftentimes in a discussion, there are a lot of different ideas flying around — one member of the group might contribute something that directly contradicts what was said immediately prior, but all around the room you see head nods indicating “yes.” So do they agree with the first person, or the second? A great facilitator can quickly make order out of disorder, summarizing the brilliance coming from the group and assimilating the different perspectives into a cohesive, agreed upon plan. This sounds like the trait of a kindergarten teacher at some level, and of course, everything we all know we learned in kindergarten! There are quieter more introverted people in every group, and there are super-extroverted people in every group too. Within the day-to-day business of an office, that latter group tends to win out. A good facilitator makes sure that the quieter group has their day at the facilitation event and their voices are heard just as loudly. Imagine you’re gathered around a common table with your team collaborating on developing new ideas for your organization. As team members voice ideas and concepts, they’re added to a shared screen for the group to see so that you can build and find the best solutions to the problem. This is what we call interactive software. The purpose of this method is to disassociate people from the concept that ‘this idea belongs to that person’ and instead bring everything back to the group. It creates more ownership and engagement throughout the meeting process, leading to deeper team collaboration and greater results. A seasoned facilitator knows that they have to be mindful of everyone’s goals; the leaders goals, the team member’s goals and the goals of the meeting itself. When a facilitator is viewed as a shill for the leader only and not oriented to the results of everyone at the event, it can disengage trust and create deeper problems within your organization. This ties to the previous point — all participants need to know that the facilitator has the best interests of the entire group (not just the top leaders) in mind. They need to be able to consistently model how trustworthy they are, and they respect all the attendees and the processes you’ve defined together. Trust, integrity, and respect are the cornerstones of all successful relationships, and the one between a facilitator and his/her attendees is no different. Obviously, if you’d like to hire me as a facilitator, I’d welcome the chance to speak to you about your needs. But if you’re reading this based somewhere else and/or are considering bringing in a new facilitator, consider the qualities we’ve reviewed here. In order your facilitation to be truly effective — i.e. hit the goals you intend for it to hit in your business development — you need to make sure the facilitator you choose has a mix of these core characteristics.